I honestly have no idea where I first saw this pattern. 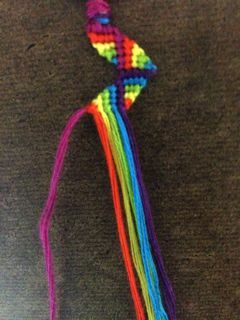 Although you get a shaped bracelet (like in this tutorial), the idea for this kind of zigzag is a lot more like this one. This makes for a nice, neat zigzag shape with almost perfect 90 degree angles. Personally, I think this pattern really reaches its full potential when doubled up. 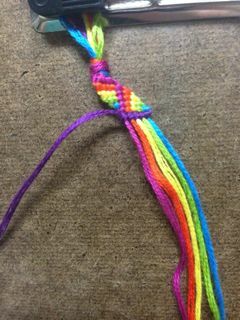 If you are doubling this bracelet, connect the 2 halves by knotting your first strings together at the beginning of Part 1 every time. Remember that one half will be a mirror image of the other, so everywhere you are making a FK on one side will be a BK on the other side, and vice-versa. As for the string length, it really depends on your wrist size and how tightly you tie your knots. However, if you'd really like a general guideline, I cut my strings to be ~120cm long which made a bracelet ~15cm long (plus ~10cm braided ends). 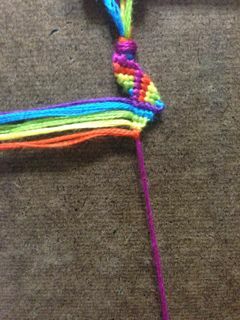 This bracelet is pretty easy, but can be kind of a pain to knot due to the changing direction of the stresses as you tie the strings (e.g. your anchor might not always feel so anchor-y). It might help to have another clip or extra tape if the lack of a real anchor is hindering your ability to make good knots. 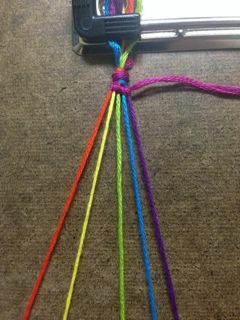 Take your first string (R) and do forward knots across all the strings. Take the next string (O), and make FKs across all but the last string (R). 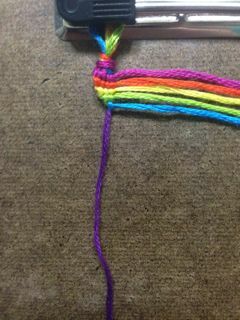 Taking your first string (R), make backwards knots across all the other strings. 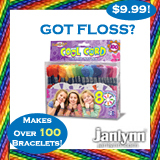 As in Part 1, decrease the number of knots you make with each color. Again, the last string (P) will not show. This is where we deviate from this tutorial! 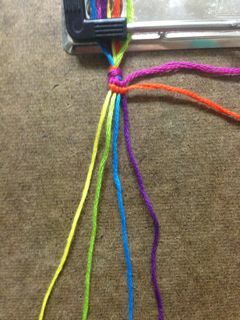 Take your last string (P) and make BKs across all the other strands. 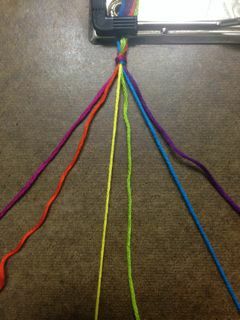 Continue BK across with your other colors, decreasing one knot each time. In this part, your first color (R) is the one that won't show! 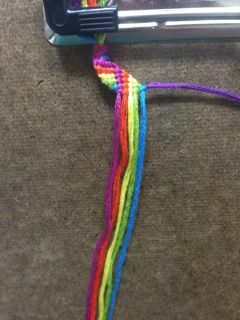 Take your last string (P) and make FKs across all the other colors. 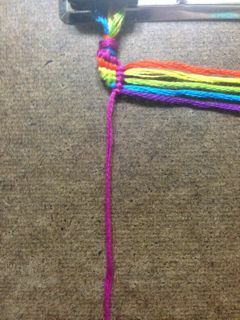 Just like in the other parts, decrease the number of knots across with each color. Congratulations, you've learned the entire pattern! All you need to do now is repeat Parts 1-4 until you have a full-length bracelet. Good luck! I hope this tutorial has been clear and informative. Please feel free to ask questions/make comments. 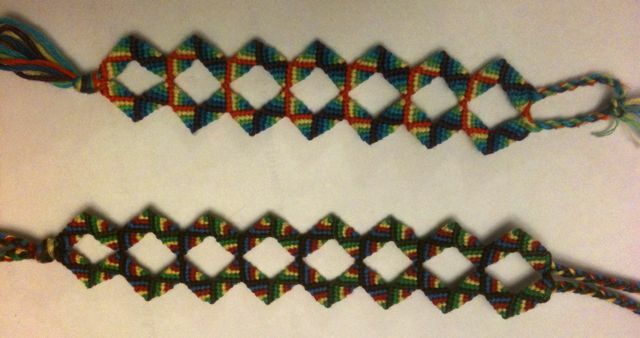 I look forward to seeing the bracelets people make! The original author of this tutorial is makotocrafts, but it has also been edited by Foz and Alicat. The tutorial was last updated 4 years ago.